Some of Veda HIlle's influences: "The songs of Brecht and Eisler, writers Annie Dillard and Russell Hoban, filmmakers Hayao Miyazaki and Wes Anderson, artists Stephanie Aitken and my name is scot, pink gin, mechanical toys, crocheted animals, Lonely God potato chips and faulty translations." | Image: Emily Cooper. Veda Hille has released 20-odd albums of exquisite art song and idiosyncratic folk music, but these days theatre calls her name. The composer helped create hit musicals A Craigslist Cantata, Onegin and the East Van Pantos, versions of the latter two on Vancouver stages right now. Hille also composed the music for Neworld Theatre's King Arthur's Night, which premieres in Vancouver at the PuSh International Performing Arts Festival (Jan. 31-Feb. 4), as well as for Bakkhai, the sensational new version of Euripides' tragedy, that wowed full houses at Stratford Festival earlier this year. Like many talented musicians, rock stardom was the pianist's initial aspiration. Here's Hille's explanation to The Globe and Mail's Marsha Lederman, which we share here at length because it encapsulates the artist's creative pursuit with concision and a lovely honesty. "There was a time when I realized I wasn't going to be a capital R Rock Star—because that, of course, was my aim in my early 20s. And I got a little bit close but then I started getting weird, started writing songs about plants; I don't know what I was thinking. And it became clear that what I was interested in creatively was moving away from the mainstream and so I had a time where I had to grapple with my own perception of success. But I think that the key for me is that I've continued to be supremely engaged with the work I do and it's never felt rote or tedious and that has served me really well. And now it turns out that what I thought was a sideways commitment to hanging out with cool theatre people is turning into the major part of my career at this point." 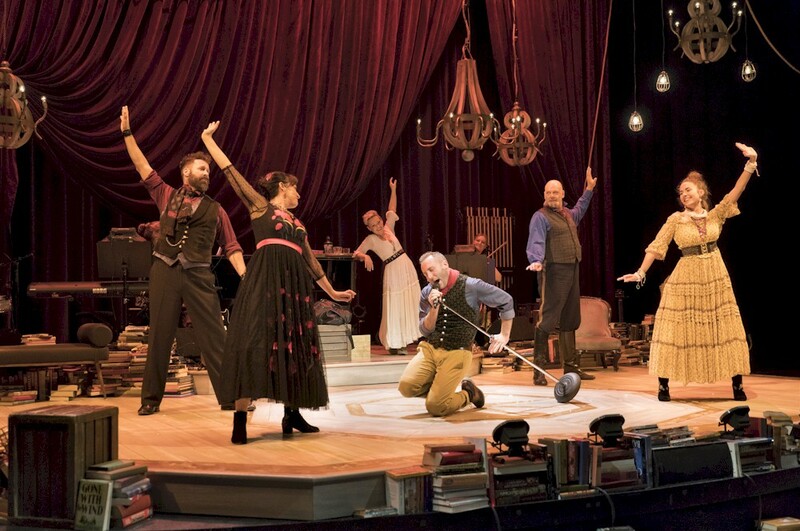 The cast of Onegin in the 2017 Arts Club Theatre production. Critic Colin Thomas writes, "I almost fainted from pleasure the first time I saw it and people I trust have told me it's even better this time around." | Image: David Cooper. “I think theatre is having an amazing time right now," HIlle recently told The Vancouver Sun. "I think that theatre—and musical theatre—still deliver something you can’t get digitally. Theatre is still one of the places that gets people excited, and they go out and pay for a ticket to see a show." A few days ago, we emailed the busy musician a list of 20 questions, which she whizzed through in about 20 minutes. Here are her speedy, fun, and thoughtful responses. What most appeals to you about the work do? I'm too entwined with music to see it as appealing (or repelling). There's no escaping it. Next place you will travel and why. Hawaii! For an actual holiday. Then Scotland for a writer's residency, just so I don't get too attached to beaches and sun. How does a panto come into being? I don't know about other pantos, but ours starts in the spring. The writer does the first round of work, then I come in for a summer workshop and start figuring out the songs. The rest of the team starts to get rolling then too. Rehearsal in November is still very generative, especially with our great casts and designers. It's really a whirlwind right up until opening night. Projects in the works? Ami [Amiel Gladstone, co-creator of A Craigslist Cantata, Onegin, and the first two East Van Pantos] and I are starting a few new things. And I'm looking forward to some more music shows in 2018. Favourite place in Vancouver? My house. My friends' houses. Anywhere near water or in woods. Place you’d like to live other than Vancouver? Berlin. Best aspect of Vancouver’s music scene? The players, of course. Are music folks much different than theatre folks? Yeah, but we all get along. Deadlines for creative activity: good or bad? Sometimes. You are so busy with theatre. Is your latest album Love Waves getting the love it deserves? I didn't get to tour it enough. I have more time this year coming up, so I'm gonna try a little relaunch. I just want to play the songs some more. King Arthur’s Night features a radically inclusive cast of actors/singers, live band and 20 member choir. What was most challenging about working on this project? Finding the right way for music to be in a show that is not a musical is always tricky. This show has lots of music, but it is all there as a support for the main structure, rather than being the reason for the show. But this piece is such a wild pleasure, I'd do anything to be a part of it. I'm just glad to work with these people. In a September blog post you wrote: “The way the world kicks into brisk decay never fails to inspire.” Please elaborate. I love the fall. Nature is a very reliable joy for me, especially these days when humans seem extra complicated. Three favourite albums these days? This Is The Kit: Moonshine Freeze. Destroyer: Ken. OMD: The Punishment of Luxury. An idea for a song comes into your head, and then you.... I pursue the idea until it becomes something I want to sing again. Best time you’ve had in your life? Surely that's still to come? I can hope, at least. Your son is nine. Did motherhood make you a busier artist? Motherhood has certainly made me a busier person. I enjoy the way that my son has become more important than music. So music finally has a chance to breathe. Most intriguing work of art/performance you’ve seen recently? I'm still thinking about Dynasty Handbag at PuSh last year. What’s the last thing you geeked out about? Risotto. PARMESAN RINDS IN THE ACTUAL STOCK OMG. What do you most enjoy doing for others? Cooking, for sure. And mixing drinks. Hille's Bandcamp bio: "Born August 11, 1968 into a nice family in Vancouver, Canada. Started playing piano in 1974. Childhood interests included plants, books, microscopes, science fiction, and psychiatry. Attended art college in the late 80’s and started writing music. Now makes records, writes musical theatre, scores films, teaches songwriting, tours, and generally keeps busy." | Image: Kate Henderson.